Ningura Naparrula walked in from the Gibson Desert with her late husband Yala Yala Gibbs Tjungurrayi in the late 1960’s and during their early years at the government settlement of Papunya she assisted him as he created his precise and detailed Tingari Paintings. They had returned to live in Kintore during the Papunya exodus of the late 1970’s. Ningura’s dynamic compositions are exemplified by strong linear designs, slowly built up through intricate patterning. These are boldly defined upon a background of dense, monochrome infilling. In common with several of her contemporaries, her aesthetic, anchored in the activities and sacred rituals of ‘women’s business’, reflects a softer, more organic vision in comparison to the intellectual strictures of the early classic style devised by the Pintupi painting men. Ningura’s focus centers upon the travels of her female ancestors across a vast visual backdrop as they created sacred sites and established customs and ceremonies. Her work manages to convey the vibrancy of the ongoing life activities of the women such as gathering bush tucker, giving birth, dancing, and singing in ceremony. All are fused with a living understanding of the environment. 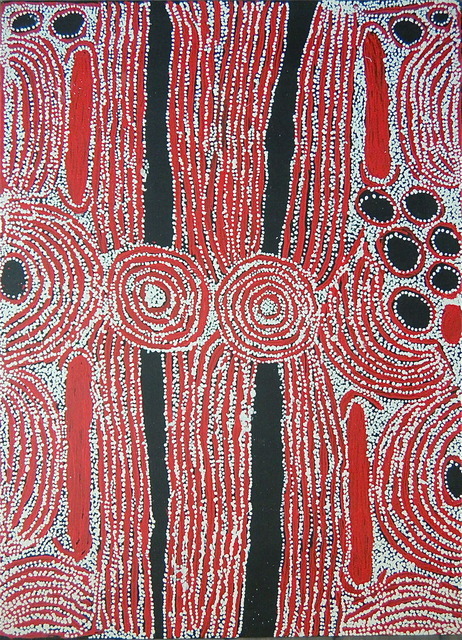 In this relatively small work created in 2006 measuring 121 x 62 cm., the large rounded shapes at the centre of the canvas represent waterholes and surrounding sand hills. Thickly layered acrylic paint emphasizes an earthy substantiality. The visual intensity of the uncomplicated yet detailed line work draws contiguous shapes into a dynamic harmony. One senses the moment as the earth awaits new life. Ningura Napurrula was one of the eight Australian artists selected for the architectural features of the Indigenous art Museum, Musee du Quai Branly, in Paris. The prominence she received following the Paris commission sits atop of a steady public esteem that is evident in the extensive number of exhibitions and collections in which her paintings have appeared, both in Australia and overseas in recent times. Ningura’s highest price at auction is still the $113,018 achieved for a work created for Papunya Tula in 2006 and sold in their fund raising auction held in Paris to coincide with the opening of the Musee du Quai Branly museum. However as this was a special event with the proceeds going to a dialysis unit in Kintore and it should not be seen as indicative of the value of the artist’s best works. Her selection to complete the large ceiling panels in the Musee du Quai Branly had literally catapulted her into the public eye, and as a consequence drew her out of Kintore and in to Alice Springs where she could more easily meet the burgeoning market demand for her works. While still an active member of the Papunya Tula organization, she became one of a number of Papunya artists that took advantage of the renown that their art has brought by painting for a wide array of dealers in Alice Springs and beyond. The international hype around her work resulted in an overheated primary market and during the last 3 years buyers have been able to purchase works by Ningura from auction houses at more affordable prices than in primary market galleries. With the furor over ‘poaching’ stimulating spirited media debate during 2005-2007, Ningura Napurrula, Naata Nungurrayi, and Makinti Napanangka became the most contentious of female painters and works with Papunya Tula provenance skyrocketed in value. These are very tightly held and will sell for a premium whenever offered. Paintings by Ningura work best on a large scale where she has room to create freer sweeping and more gestural shapes prior to infilling with a thick pastiche of dots. These alone amongst her works created for independent dealers will compete well at the highest level in the market. Buyers should be careful with works by this artist. There’s a great deal of difference between paintings that are highly collectable, and the large number of ubiquitous minor paintings.